We love dogs, we think the world is a better place because dogs live in it. We have dog walking experience with many dog breeds, if your dog is a breed we are not familiar with your dog walker will research the breeds specific needs prior to the dog walk. For your peace of mind all dog walkers are bonded, insured, pet first aid certified and have had a back ground check. We have been walking dogs since 2007. Scheduled dog walks are available during daylight hours 1 to 7 days a week 365 days a year. Private or semi private dog walks in Huntington Beach start at $25.00 each for 30 minutes or $35.00 per hour for one dog. Please note there is a 5 dog walk minimum for first time clients. Your dog will have a fun individual dog walk and will be walked around where you live. Private dog walks need a 3 to 4 hour time frame to ensure we can provide a walk for everyone who needs one. Daily social dog walks small groups, on a social walk your dog will have fun and enjoy a walk with other dogs. Starting at $25.00 per walk for one dog who is not a special needs dog. We offer social dog walks for the busy dog parent who would like their dog to have social time. 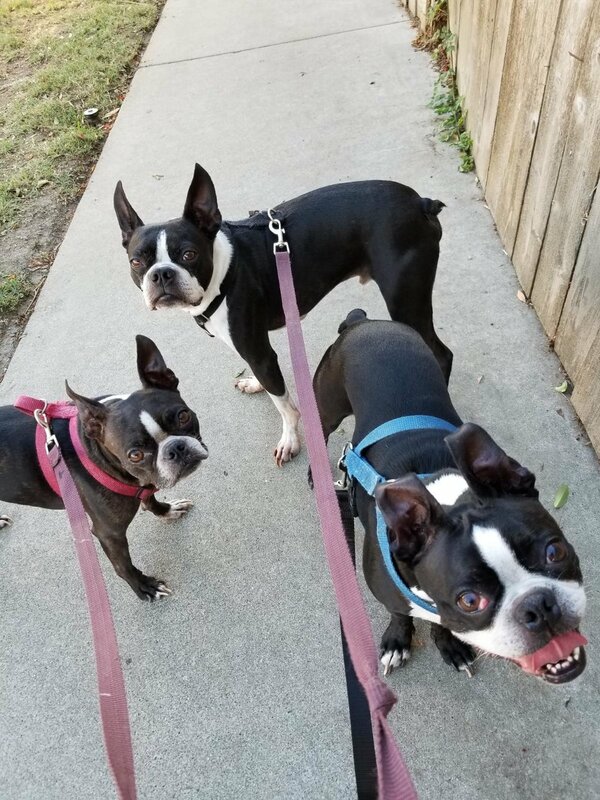 Your dog will have a walk with 1- 4 friendly dogs at a local Huntington Beach trail, housing tract, park or other fun location. Dogs are social animals, they crave the companionship of other dogs, the same way we as people need to have social times such as going out to lunch with our friends. Your dog will have lots of fun and new doggy friends to brighten their day. Dogs must be friendly with other dogs and people. Dogs must be up to date on vet recommended vaccinations or have had a titer test and clearance from a vet. If you are in need of a vet feel free to visit my resources page. Includes - social dog walk and or play time. This dog walk is a minimum of 30 minutes of walking and socializing, however your dog may away having fun on their adventure from 45 minutes to as long two hours depending on the schedule for the day. Scheduled social dog walks are available Monday through Friday, private dog walks are available 7 days a week. Scheduled walks are for the dog who needs a consistent schedule each week and wants their slot in the dog walking schedule guaranteed. Please see policy page regarding scheduled walks. Dog walking rates are for one dog, if you have more than one dog and they are easy to walk add $5.00 per each dog. If your dog is a special needs dog please Email or call for rate. Social dog walks are between 10:00 am and 2:00 pm and can not be time specific as the schedule changes daily. Please note that while your dog may be picked up at 10 they will not be returned until 11:30 or later if your concern is that they have a mid day potty break. Please see our dog walking policy page for a list of additional services and holiday fees. Click here for policy page. If you live in Orange County but outside of my Huntington Beach dog walking service area or need a pet care service I do not provide, feel free to Email me as I know many dog walkers in Orange County and will be happy to provide you with a referral.